APC Enclosures are the ideal solution for racking server and storage hardware while ensuring you have proper air flow! Enclosures from APC come in a wide variety of sizes. With models ranging from 6U through 24U, we offer every customer from SMBs to Enterprises an option to rack their IT infrastructure. In addition, some models come with a built in PDU (power distribution unit), lockable doors, and soundproofing to make any room become a server room instantly! Aventis Systems is proud to offer models from the APC Series as seen below! 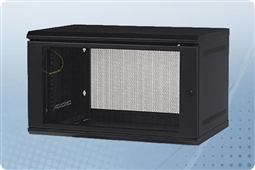 APC NetShelter SX Series, ideal for customers looking to maximize on air flow, power distribution, and cable management with their rackmount enclosure solution! APC NetShelter WX Series, made for unique or small environments where space is a commodity, these racking solutions have compact 6-12U designs for easy wall-mounting! Aventis Systems is proud to offer all our APC Enclosures with a 1 Year Standard Essentials Warranty with upgrades available for Express next business day parts replacement or Extended Term Warranties. Shop our APC Enclosure options below and bring the best in industry reliability for racking your IT infrastructure to your business today!